This rice vermicelli is lightly flavored and made with a bounty of vegetables as well as pork. Vegetables used include cabbage, onions, carrots, and bell peppers. 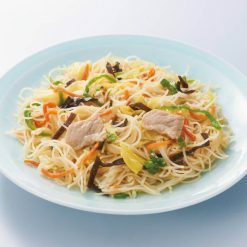 This rice vermicelli is lightly flavored and made with pork and vegetables. The vegetables used include cabbage, onions, carrots, and bell peppers. 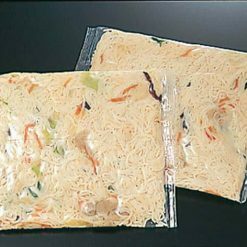 This product contains vegetables (cabbage, onions, carrots, bell peppers), rice vermicelli, sunflower oil, pork, wood ear mushrooms, flavoring extract (pork, yeast), table salt, soy sauce, oyster sauce, sugar, (contains wheat and chicken meat).. This product is not suitable for anyone with allergies to wheat, soy, chicken or pork. Origin of ingredients: cabbage, onions, pork (domestic). Prepared and packaged in Japan.